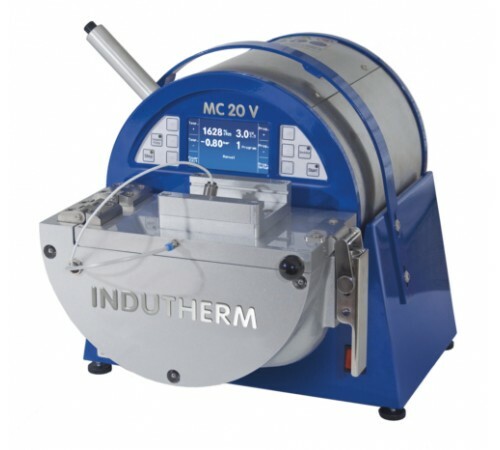 MC-20v Indutherm Casting Machine Common Process for Melting The MC 20 V is designed based on the same tilting principle as the MC 16. However it is systematically designed for intricate casting projects in continuous operation in larger foundries.Overview MC 20 VThe new 2,000°C MC 20 V tabletop casting machine:cutting-edge technology in the most compact space.Very easy and safe to use, short implementation timeExcellent price-performance ratio3,5 kW induction generator for quickly reaching the melting temperatureThorough through-mixing of molten metals using low-frequency induction tuningMelting under vacuum or inert gas to prevent oxidationTop quality form filling using overpressure of up to 3 bars (casting under vacuum also possible)Economical consumablesLatest generation generatorsThe MC 20 V is equipped with a latest generation induction generator, developed especially for this housing design and with high operating efficiency. Convenient, high precision control is provided via a new operating system, with an LCD display, full text display and program control.Award-winning vibration technology – unique in its class For the first time, our multi-award winning and patent-pending vibration system is now available in a compact casting machine. Using vibration when casting ensures better form filling, creating casts with greater, more consistent densities, higher elasticity and greatly reduced porosity. Vibration technology is a compelling alternative to the frequently used and relatively delicate centrifugal systems, especially when casting platinum or palladium.Technical Details: performance performance max. / electrical connection 3.5 kW 230 V single phase maximum temperature 2000° C capacity crucible volume 100 g Au 18 ct 110 g steel / 200 g Pt for use of flasks up to bis ø 30/50/65/80 mm x 80 mm H handling+control control panel LCD-Display, full text display vacuum or overpressure after casting -1 up to +3 bar temperature measurement/control up to 2.000° C accessories vacuum pump (min. 8m3/h) .. The MC 20 V is designed based on the same tilting principle as the MC 16. However it is systematically designed for intricate casting projects in continuous operation in larger foundries. cutting-edge technology in the most compact space. The MC 20 V is equipped with a latest generation induction generator, developed especially for this housing design and with high operating efficiency. Convenient, high precision control is provided via a new operating system, with an LCD display, full text display and program control. For the first time, our multi-award winning and patent-pending vibration system is now available in a compact casting machine. Using vibration when casting ensures better form filling, creating casts with greater, more consistent densities, higher elasticity and greatly reduced porosity. Vibration technology is a compelling alternative to the frequently used and relatively delicate centrifugal systems, especially when casting platinum or palladium.